John Leroy Gonzales Jr., 68, entered into the presence of HaShem, our God, after years of ongoing medical issues on September 20, 2018 with his soulmate of 51 years at his side in Cañon City, Colorado. He was born on September 26, 1949 in Delta, Colorado to Eva and Pete Gonzales. He attended Delta schools and graduated from Delta High School in 1967. In 1968 he would meet his soulmate, Evelyn Ruybal, and they would marry on July 12, 1969. Over the next three years they would be blessed with two children while living in Grand Junction, Colorado. He started working at the age of nine in the fields to help support his family and would hold different jobs all throughout high school to continue to help out. He was the oldest of nine children. John worked at Mesa College in maintenance and landscaping for 5 years. They then moved to Montrose, Colorado where he worked as a gold miner and hard rock blaster in the Idarado Gold Mine at the top of Red Mountain Pass. When the mine closed he then moved his family to Paonia, Colorado where he went to work for the Westmoreland Coal Mine in 1980. When that mine closed he relocated his family to Cañon City, Colorado in 1985 and went to work for the Energy Fuels Coal Mine in Florence where he would enjoy having his daughter work with him for two summers. He will always be remembered by his co-workers for his sense of humor and mischievousness which earned him the name Johnny Boy! After the closing of Energy Fuels he and his wife established their own business. They started Quality Cleaning Janitorial Services where he was responsible for all of the floors and windows in the business across the state of Colorado. 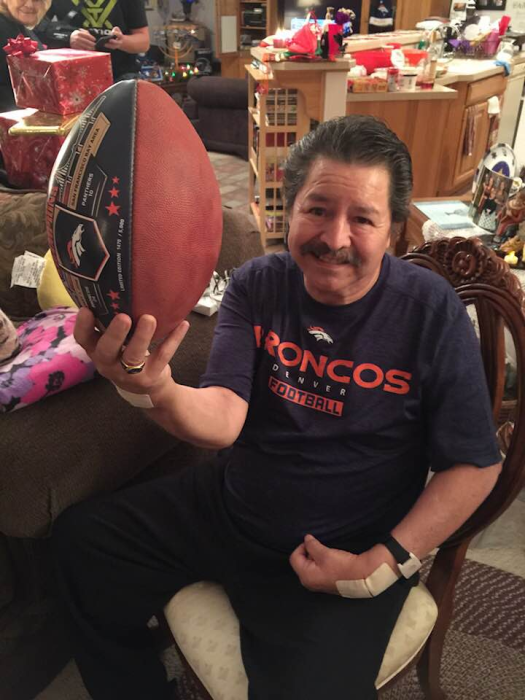 John was an avid Denver Bronco fan and had a huge Bronco collection. He knew all the players and knew their schedule by heart. He and his son attended many games over the years. He loved to hunt, camp, and fish! He especially loved his hunting adventures with his son and his brothers. Above all things, John loved his family and was very proud of his children and grandchildren. He loved spending time having them over for Bronco parties, cookouts, and camping trips. He loved kids and coached his son’s little league baseball team. Neighborhood kids would come over and ask his wife if her daddy could come out and play. He had a kind, loving, and giving heart. He was involved in the collection and distribution of food for the local food bank and the Catholic Church in Paonia. He and his wife also led the youth group for that church. They were involved in Cursillo and Marriage Encounter ministries. His love for the Lord was evident and he was involved in many prayer meetings and bible studies. John is survived by his wife Evelyn (Ruybal) Gonzales; his children Raquel (Alan) Mullineaux, William (Dolly) Gonzales; grandchildren David (Sarah) Mullineaux, Johnathan (Tori) Mullineaux, Daniel Mullineaux, Gabriella Gonzales, Adriana Gonzales,Angelina Gonzales; one great-grandchild Wyatt Mullineaux;long time friend/brother Mario (Linda Mae) Ramos; siblings Sandy Gonzales, Gene Gonzales, George (Leona) Gonzales, Christina Gonzales, and Rose Gonzales and numerous nieces, nephews,and great- nieces and nephews. John is preceded in death by both parents; brothers Pete Gonzales, Joseph Gonzales, Billy Gonzales, and his in-laws Bill and Connie Ruybal. Visitation will be held Thursday, September 27, 2018, from 6-8 p.m. at Harwood Funeral Home in Cañon City. A Celebration of Life Service will be held Friday, September 28, 2018, at Harwood Funeral Home at 10:00 a.m. in Cañon City. Graveside services will be held at Lakeside Cemetery in Cañon City, Colorado. A dinner will be served at The Event Center at the Abbey immediately following internment.